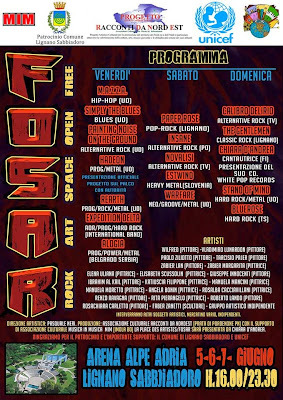 FOSAR have announced their special headliner for the 2015 Festival, Serbian Prog-PowerMetal icons ALOGIA. 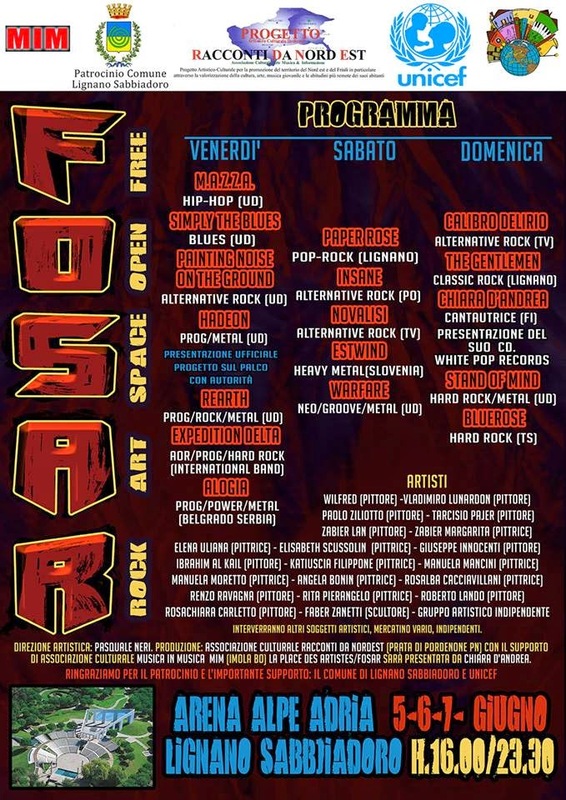 Mark June 5-6-7, 2015 on your calendar and plan to be at FOSAR (Free Open Space Art Rock) a multi-genre Music Festival held yearly in Lignano Sabbiadoro, destined to become international very soon. It will be an unbelievable selection of musical and artistic delights offered to thousands who visit the Festival daily, throughout three days and nights. A musical celebration under the sun and stars in a friendly, peaceful, rocking atmosphere, where you can drink delicious beer, make friends and listen to amazing Music! Musically, the 1st day of the Festival, on Friday June 5th, is going to be headlined by the widely acclaimed Serbian rockers AlogiA. The show is taking place in the historical, stunning location of Arena Alpe Adria in Lignano Sabbiadoro, holding thousands of people daily. The Arena Alpe Adria is not only an historical monument, but also a scenery that will astonish both metal-heads as well as families with children alike. AlogiA: Power Progressive Metal band from Serbia, with15 years of glorious history/musical background. During their shows they’ve been able to fill: big theatres (https://youtu.be/XfxrFX1XrSg), whole stadiums (https://youtu.be/lcPYY2WBeHc), great squares (https://youtu.be/fhYi5ECel9I) They also played supporting historical acts as: Whitesnake (https://youtu.be/jiJ8O5TF9-I), Apocalyptica (https://youtu.be/1NXebcWMP6k), Savatage and many more! Their new album Elegia Balcanica is out now in Serbia and it’s scheduled to be released worldwide in 2015 Expedition Delta: International supergroup born as a project from Srdjan Brankovic, one of the founders of AlogiA. Srdjan is working and has worked as a guitarist, songwriter, producer in many other important Serbian bands such as Psychoparadox, Hexagram, Draconic, Numenor, Lunar Pocket, Despot... besides AlogiA and Expedition Delta, of course! The music of Expedition Delta is a mixture of Melodic Rock (AOR) and Progressive Rock, with the elements and influences of modern music merged into many atmospheric parts. The whole album is leaded by the great voice of Nikola Mijic, with some very special guests who duet with him. Together with Srdjan Brankovic, many famous and great musicians have been involved into this project, in the past: Gary Werhkamp (Shadow Gallery), Andrea De Paoli (Labyrinth), Erik Norlander, Rene Mekelbach (Ayreon), Richard Andersson, Joost Van der Broek, Sabine Edelsbacher (Edenbridge), Borislav Mitic, Vivien Lalu, Alex Argento (Orianthi), Mikkel Henderson (Fate, Evil Masquerade, Circus Mind), Saska Jankovic, Milos Kovacevic, Torsten Rohere (Silent Force), Santiago Dobles (Aghora)…. More and new ones are going to be announced for the new upcoming work, as well! Some of the world finest performers have been blended, and Expedition Delta is the result. EstWind is a Slovenian heavy metal band formed in 2010 from members of ex band Soldiers of Afghanistan, Woliwo and Keller. Their music could not be easily defined as classic old-school heavy metal because of more progressive experimentations and inclusions of some thrashing riffs. Bluerose; They have released 2 albums so far: Fallen From Heaven, their very first AOR album, has been released first as an indie record and then re-published by Areasonica Records and Blue Tattoo Music. It has achieved numerous notable reviews from all the metal movement. Fallen from Heaven is a concept album which tells the story, through 10 tracks + 8 interludes, of an Angel named Bluerose, who has fallen on Earth, describing his emotions during this journey. The emotions felt are those of a human during his whole life. The second release, called Darkness and Light, is now available on digital stores and is produced by Areasonica Records and Bluerose, and distributed in all CD shops in Italy. It contains 8 new fresh and powerful tracks, alternating the Bluerose rock style with more metallish guitars and superb vocals. Rearth, is a prog/rock/metal band from Udine born from the brainchild of Fabio Tomasino (guitars) and Simone Paoloni (vocals). The duo originally started to play into a thrash metal band; then decided to begin a more personal project mixing different musical genres. The main thought was to enhance the music with the emotions of the lyrics. In 2011 they released the first demo Pure and Simple. Self produced, registered, mixed and mastered by Fabio Tomasino (Artwork by Simone Paoloni) In 2013 it was time for their first album For My Dreams I Fall, self-produced, registered, mixed and mastered by Fabio Tomasino again. experiences. In 2009 they released a first album: The Revenge, recorded by Riccardo Asquini at Saojo Studios. The Revenge gained great response from the audience, that allowed to the band to pursue an intense live activity in the following years, including a performance as opening act for Extrema. On December 2011, the band came back to the studio to record the 2nd chapter , an EP called Drops of Cold Flowing, recorded at the Golden room Studios by Giacomo Barboni. The EP represents Warfare style: the Neoclassical Groove metal, a groovy modern metal influenced by the melodies of classical music. In July 2014 the band , being the winner of the Up to Down contest, has been chosen as opening act for Down of Phil Anselmo in front of thousand people. Can’t miss. Be there… It will be just SPECTACULAR!